The Grand Circle is one of my favorites. The loop goes through Utah, Nevada and Arizona. The starting and ending point is Salt Lake City. The stops are Bryce Canyon, Zion NP, Las Vegas, the South Rim of Grand Canyon, Page (Antelope Canyon and Lake Powell), Monument Valley, Arches NP, Canyonlands NP, Dead Horse Point State Park. This trip is approximately 1500 miles (2400 km) long. The best season to visit this area is spring or fall. In the summer, the temperature can reach 130 F or 40-50 Celsius. Allow yourself 2-3 weeks to enjoy it, at an unhurried pace. Small Circle is a shorter variation of the Grand Circle. This loop starts and ends in Las Vegas. The stops are the South Rim of the Grand Canyon, Page (Antelope Canyon and Lake Powell), Bryce Canyon and Zion NP. This is a 740 mile (1200 km) long trip. I recommend a minimum stay of 7-10 days. This small circle could be a second part of your travel after you have spent a week at another destination, for example, New York City. The Canadian Rockies are just gorgeous! This trip's starting point is Calgary. 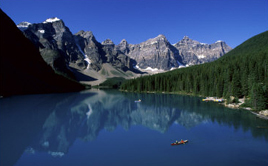 The trip goes through 4 national parks: Banff, Kootenay, Yoho and Jasper. The length of your trip is approximately 620-680 miles (1000-1100 km). If you also like to hike, allow yourself 2 weeks for this trip. If you have one more week, you can go further to British Columbia. On the way, you can visit Glacier National Park, Revelstoke National Park, Victoria, Vancouver Island, Pacific Rim National Park and Gwaii Haanas National Park and return from Vancouver. Rocky Mountain National Park is beautiful! It is the best place to get some high altitude experience. This trip can start from Denver. The park has lots of roads on both sides of the Continental Divide. There are many possibilities to visit the entire park by car. There are almost unlimited hiking trails, too. I recommend 10-14 day stay if you love nature and hiking. Arches and Canyonlands National Parks are just a different world! Starting point can be Salt Lake City or Denver. In the park you go by car between interest points then take a short walk or hike. This is also one of the best places for a jeep tour. Allow yourself 7-10 day stay to enjoy the area. Lake Powell is the best place to rent a house boat and explore the lake shore. After a 3-7 day boat trip you can visit: Antelope Canyon, Bryce Canyon and Grand Canyon south rim. The closest city is Phoenix, AZ. Allow at least 2 weeks for this trip. The skiing trip is for ski lovers. I recommend Colorado's ski resorts or Whistler in Canada. Allow yourself to stay at least a week. The fishing trip is for the passionate fishers. The best place for this activity is British Columbia or Alaska. There is also fly fishing in Rocky Mountain National Park. In British Columbia there are four major types of fish; salmons, sturgeon, trout and steelhead.